He said: "I'll run as many as I can. I've won it before and it would be nice to win it again.Basically I'll run whatever gets in. If I can get 10 to 15 in, I'll run them all. "We look forward to it. Obviously it's a race we target and want to win. It will be very hard for Tiger Roll. He's got a lot more weight this year, but we'll see what happens. "Obviously we have Dounikos and General Principle, who ran well in the trial at Punchestown. They'll be going. We'll try to get them all in because if you're not in, you can't win." Mullins, who trained the 2005 National winner Hedgehunter, said: "I was delighted with Pleasant Company last year (second), but never thought he was going to get there. Maybe he will this year. It's been the main plan for him this year, as it has for a few others. 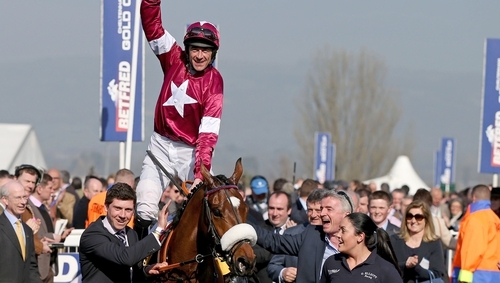 "Rathvinden may go for the Bobbyjo Chase at Fairyhouse or the Leinster National at Naas. Those are the two races most of mine will have to go for as there are no other suitable ones. It will probably be Naas for him. "Up For Review ran well in the Thyestes after Paul (Townend) took him wide. I hadn't realised how well he ran - it was a fantastic trial. "Polidam and Isleofhopendreams might not get in. Livelovelaugh ran well the other day and needs further. "I was disappointed with Some Neck the other day, while Pairofbrowneyes still needs to qualify despite having won over two miles and seven and a half furlongs at Gowran - which would be like four miles elsewhere! "Total Recall might run too free for a National horse. Acapella Bourgeois could be a nice horse, but has had his problems. If I could get him back he could be anything."